The umbrella term athletics includes race walking, cross-country and road running, and the track and field disciplines consisting of running, jumping and throwing. The sport is governed by the International Association of Athletics Federation (IAAF). World Championships are held every second year at which almost 2000 athletes representing all continents compete (http://www.iaaf.org). 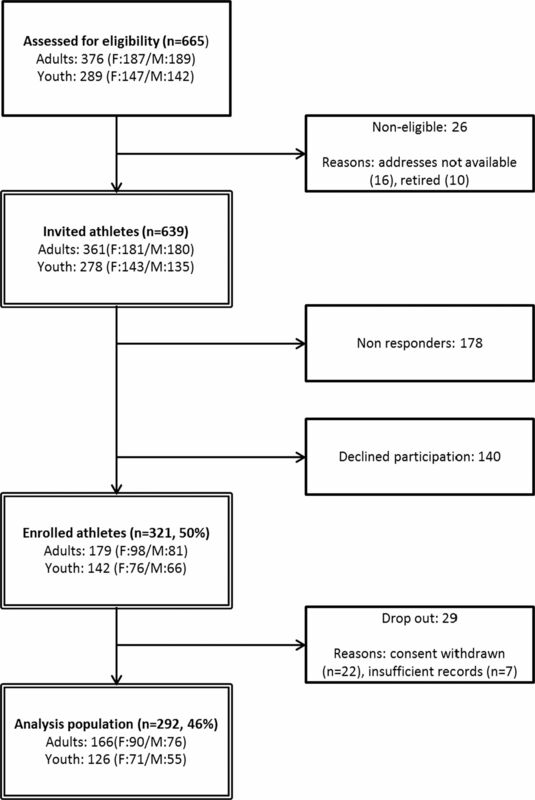 Although athletics is such a popular sport and the largest at the Olympics Games, contributing about 20% of all participants (http://www.olympic.org), surprisingly few studies have prospectively reported injury incidence and patterns in athletics athletes at the elite level, and hence limited information is available linking risk factors to athlete categories. Movement towards sport safety in athletics through the introduction of preventative strategies requires that the unique injury profile for the sport is established in typical populations of athletes.11 ,15 To our knowledge, no routine surveillance of systematic injury similar to that used by the IAAF exists at the level of national federations in athletics. The difficulties in accomplishing longitudinal studies in this sport have been highlighted.16 The aim of this study was to estimate the incidence of musculoskeletal injuries in youth and adult athletics athletes competing at national and international levels in track and field events, and to examine the type, severity and risk factors of the associated injuries sustained. The resulting knowledge is to be used to formulate principles for evidence-based injury prevention and safety promotion programme in athletics. A prospective cohort design covering a 52-week period starting in March 2009 was used for the study. The design and the routines for data collection have been reported in detail earlier.17 For this study, the concept of elite athlete was defined with regard to the national level, that is, if the athlete was ranked at the national top-10 list in one athletics discipline.17 A total of 649 athletes (367 adults and 282 youths) were invited to take part in the study. Postal addresses were obtained from the Swedish Athletics Association and from the athlete's club. Seventy-two per cent (n=461) of the athletes responded to the invitation, of which 70% (n=321) gave their written consent to participate in the study. The final study population included 50.2% of the initial selection of athletes (figure 1). Flow chart of athletes enrollment and analysis population. Ethical approval for the study was obtained from the Ethical Committee in Linköping in November 2008 (dnr. M-201–08). Informed written consent was obtained from all participants in the study. For those under the age of 18 years, approval was also obtained from their parents. Data on injury incidence and exposure during athletic training and in competition were collected using web-based questionnaires (SiteVision V.2.5, Senselogic AB, Örebro, Sweden). The data were self-reported by the athletes; assistance from parents was promoted for athletes under 18 years of age. An injury was defined as any new musculoskeletal pain, soreness or injury that resulted from athletic training or competition and caused changes in normal training/competition to the mode, duration, intensity or frequency from the current or subsequent training and/or competition sessions. Only injuries occurring while participating in athletics, training or competition were included. During the first week of the study, a baseline questionnaire was administrated asking for personal sports-specific and sociodemiographic data. Emails were sent weekly to participants with questions about the preceding week, with one reminder to those who did not respond to the first email. Before classification, the injury data were verified according to the study protocol and irregularities removed. A matrix adjusted to athletics injuries was used to categorise the coded injury data according to injury type (nature of the injury) and anatomic location (body region).7 ,18 Injuries were defined as overuse injuries if caused by repeated microtrauma without a single identifiable causal event and as a traumatic injury if resulting from a specific identifiable event.19 For one diagnostic group, stress fractures, MRI was required to verify the findings for classification. A group consisting of one physiotherapist and three physicians with a background in sports medicine classified each self-reported diagnosis into a three-digit diagnostic code according to the International Classification of Diseases, Ninth Revision, Clinical Modification (ICD-9-CM) (see online supplementary appendix table A1). The physiotherapist (JJ) and one physician (SN) assigned a preliminary code independently and any diversity in this classification was a subject for clarification. The list was then reviewed by the two remaining physicians (PR, TT). The weekly training load was quantified by combining training hours and intensity20 on a relative basis for a 6-week period in association to the start of the study. A training load rank index (TLRI) defining the relative training load was constructed by first multiplying the reported training intensity (light=2, moderate=3, hard=5) with minutes of training performed during the week. The athletes were thereafter grouped by athlete category and event group and then ranked and separated into quartiles by their training load score into TLRI categories Q1–Q4. We used time loss from athletics to define the severity of the injury,19 ,21 that is, the number of days the athlete was unable to participate (totally or partially) from the date the athlete reported onset of injury until return to normal training. Injuries were classified as slight (1–3 days missed participation), minor (4–7 days), moderate (8–20 days) and severe (>21 days). Analyses were performed first at the level of injured and non-injured athletes. The athletes had to be free of injury to be eligible for analyses. Accordingly, the injured athletes were categorised with regard to the first new injury reported during the 52-week study period. Injury rates were also calculated per 1000 athletic-hours of training. All data were presented using descriptive statistics, that is, mean, median, SD, minimum and maximum for continuous data and frequency and proportion (%) for categorical data. Frequency of injuries was presented together with the corresponding 95% exact CI for a proportion. The statistical analysis were performed on the analysis population which consists of all athletes who did not drop out from the study, that is, 292 subjects (figure 1). Differences in the proportions of subjects were analysed using the χ2 test. Severity of injury was analysed using the χ2 test comparing the order of injury (1, 2, 3, 4, 5 and ≥6) as well as gender and age category with regard to the severity of injury (minor, moderate and major). The primary end point for the injury risk analyses was time to injury. Data from the participating athletes were entered into the analyses from the first day they were free of injury and in normal training. At baseline, 96 athletes were identified as being injured,7 and therefore these athletes were left censored until the week after they reported being back in normal training after injury. Athletes were analysed according to the first injury they reported during the study period. Time to injury was analysed using the Kaplan-Meier method for presenting data descriptively and the log-rank test as a univariate test for differences among subgroups with regard to athlete category (combing gender and age group), event group, injury history, number of training hours per week, number of training sessions per week and categories of training load per week. Multivariate regression analyses for examination of time to injury were thereafter applied using the Cox proportional hazards regression. As previous studies have reported that injury risk is associated with athlete categories and previous injury, we decided to test for interaction between combinations of these factors in the multivariate analyses. All tests were two-sided and p<0.05 was regarded as statistically significant. All calculations were carried out using SPSS V.18 or higher (IBM Inc). During the study period, 292 athletes (91% of the enrolled population; table 1) submitted weekly reports covering 135.0 h of exposure to athletics (figure 2). The mean age of adult athletes was 24 years (range 18–37 years) and the age of all youth athletes was 17 years. Box-plot for median weekly (dots) training hours by study week (1 to 52). Boxes represent minimum and maximum. A total of 199 (68%) of the athletes (73% of adults and 61% of youths) reported at least one injury (table 2). The median time to the first injury was 101 days (95% CI 75 to 127). One hundred and twenty-two athletes (42%) reported more than one injury and 70 athletes (24%) reported more than two injuries (figure 3). There was a statistically significant difference with regard to gender and age category in the proportion of athletes who avoided injury (p=0.043); 16 men (21%), 28 women (31%), 20 boys (36%) and 29 girls (41%) reported no injury during the study period (table 2). Differences between subgroups of events could not be statistically demonstrated (p=0.937; figure 4B). 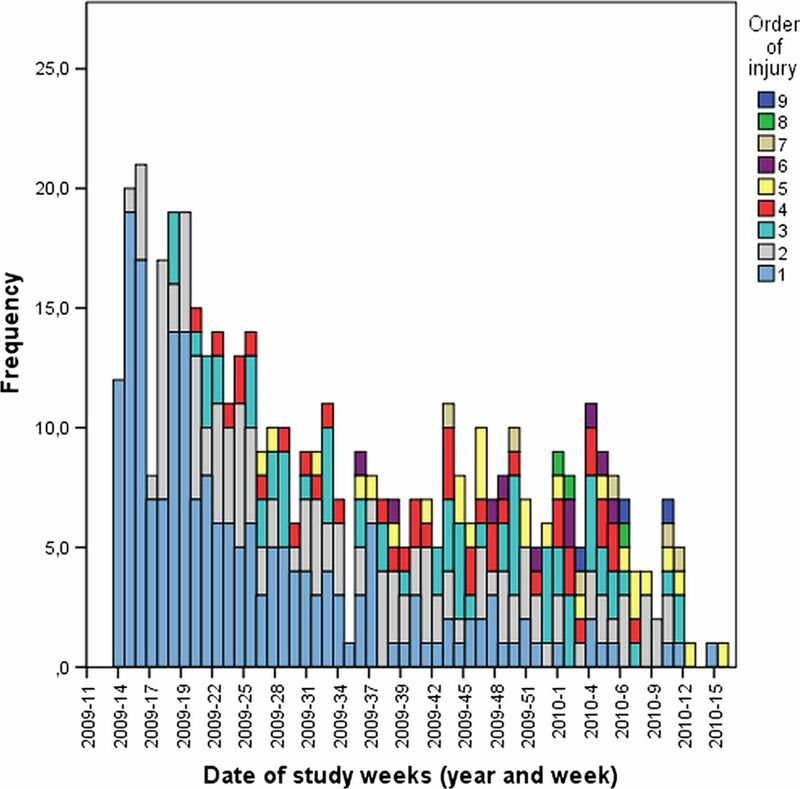 Distribution and time of the injury events during the study year displayed by injury order 1–9. Kaplan-Meier curve for time to first injury during the study season displayed by athlete categories (A) and event groups (B). A total of 482 injuries were reported; 199 (41%) primary injuries and 283 (59%) were recurring (22, 8%) or subsequent (261, 92%) injuries. The cumulative injury incidence in the study population was 3.57 injuries/1000 h of exposure to athletics (men 3.76/1000 h, women 3.62/1000 h, boys 3.89/1000 h and girls 3.13/1000 h). Seventy-seven per cent of injuries occurred in a lower extremity (76% among adults and 78% among youths). The most common locations were the Achilles tendon, ankle, foot and toe (28%), followed by the hip, groin and thigh (24%), and the knee and lower leg (24%). Ninety-six per cent of injuries reported were classified as non-traumatic (caused by overuse); 55% had gradual onset and 41% had sudden onset. For adults, the most common diagnoses were Achilles bursitis and tendinitis (17%) and sprain or strain of hip or thigh (13%; table 3). Youths reported most injuries in the category of sprains and strains of hip and thigh (16%), sprains of ankle or foot (14%), and shin splints (13%; table 4). Separating the event subgroups, the most frequent diagnosis in sprinters was hamstring strain (23.5%), calf/shin splits (22.5%) and Achilles tendinitis/bursitis (19.4%) in middle-distance and long-distance runners, lumbago (11.2%) in throwers, while jumpers mostly had thigh injuries with gradual onset (11.2%) and hamstring strains (10.2%; table 5). Most injuries (73%) were reported to have occurred during training; 13% from technique-specific training, 12% from interval training, another 12% from sprint training, 11% from warm-up and 10% each from distance running and weight training (data are missing from 32% of injuries sustained during training). Eighteen per cent of the injuries were reported to have occurred during competition; information on the remaining 9% was missing. For non-traumatic injuries, the athletes reported experiencing soreness or pain in the affected area before the injury event more often for injuries with gradual onset (53%), compared with injuries with sudden onset (34%; p<0.001). Most reported injuries (51%) led to absence from normal training for more than 3 weeks (table 6). There were no differences in the severity of injuries with regard to athlete category (p=0.916). However, there was a tendency for the severity of injury to increase with the order of injury (first injury, second injury, etc; p=0.110). Severe injuries were predominantly located according to the injury matrix categories as follows: thigh/groin with gradual onset (9%), posterior thigh with sudden onset (9%), followed by Achilles tendinitis (8%) and calf/shin splints (7%). Log-rank tests revealed statistically significant variation in the risk for injury among athlete categories (p=0.046) with the highest risk in adult men. There was also an increased risk of injury for subjects with a serious injury (>3 weeks time loss) during the previous season (p=0.039), and increased risk with rising TLRI (p=0.019; table 7). No statistically significant differences between event groups could be demonstrated (p=0.879). The median time to injury was 69 person-days (95% CI 31 to 107) for previously injured athletes and 105 person-days (95% CI 59 to 150) for those with no 3-week injury the previous year. 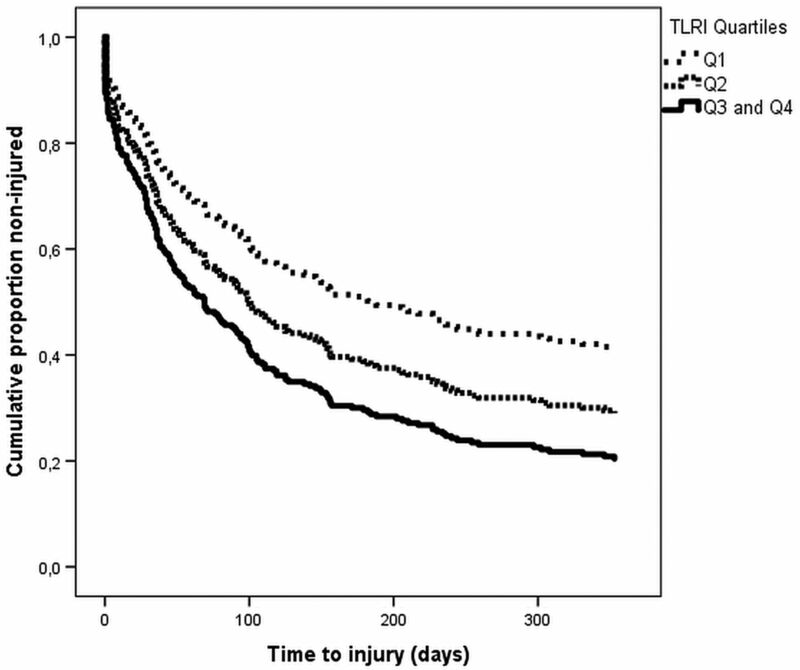 The median time to injury was 227 person-days (95% CI 1 to 453) for athletes in TLRI category Q1 and 98 person-days (95% CI 68 to 128) for those in Q4. The results of the multivariate Cox regression analyses statistically demonstrate an interaction between athlete category and history of serious injury (p<0.001; table 8). Youth male athletes with a severe injury the previous year had more than a fourfold increased risk (HR=4.39; 95% CI 2.20 to 8.77) and adult males showed more than a twofold risk (HR=2.56; 95% CI 1.44 to 4.58) of sustaining a new injury compared with youth female athletes with no previous injury (figure 5). Athletes in the third (HR 1.79; 95% CI 1.54 to 2.78) and fourth quartiles (HR 1.79; 95% CI 1.16 to 2.74) had almost a twofold increased risk of injury compared with their peers in the first quartile (figure 6). Survial curves for time to first non-traumatic injury during the study season displayed by history of severe injury the previous season and athlete categories. Survial curves for time to first injury during the study season displayed by the training load rank index (TLRI) quartiles. Longitudinal investigations of injury incidence and injury risk in youth and adult elite athletics athletes competing at national and international levels that allow comparisons across age, gender and event categories are scarce. This is most apparent at the youth elite level.24 To our knowledge, this is the first study to simultaneously follow two athletics elite cohorts during a period of 1 year. We found a high incidence of injury and more than every second injury was severe, causing absence from normal participation for at least 3 weeks. Subsequent injuries accounted for 54% of injury events recorded during the 12-month study period. Only 4% of the reported injuries were classified as traumatic, which is consistent with previous studies in athletics.1 ,5 ,6 ,13 Severe injury the previous season and a high TLRI score were found to predict the risk for a new injury during the study year. Male adult athletes showed the highest injury risk and female youth athletes the lowest; no large differences were found between event groups. The impact of the reported injuries on training and performance in athletics can be assumed to be substantial. There are few studies in athletics on athletes representing all event groups for an entire season. The annual injury incidence of 68% in this study is similar to that described previously in more specific athletics populations. In accordance with previous studies, we found that most reported injuries were located in the lower extremities.1 ,2 ,5 ,6 ,25 ,26 We also found similar injury patterns in adults and youths. Girls were most likely to avoid injuries, which is in accordance with the findings of a recent review.27 Most injuries were reported to occur during athletics training. One explanation for this finding could be that competing in athletics demands that the athlete is close to fully physically fit. Therefore, athletes with vague symptoms may have chosen to replace competition with training and thereby have sustained an insidious injury during training. The most frequently reported diagnoses were in the injury matrix category strains/cramps of the hip/thigh. The exact location and nature of these injuries were not determined in this study, because MRI reports were not collected. Muscle injuries, especially hamstring strains, is a common diagnosis (14%) reported from competitions,1 ,2 ,4 and similarly, a 12-month study showed a 14% incidence of hamstring strain.6 These findings and the high risk of reinjury28 raise urgent concerns about the identification of risk factors for prevention. Stress fractures are commonly associated with athletics. Bennell et al29 reported a 21% incidence in their cohort; only 4% of MRI-confirmed stress fractures were identified in our study. However, overuse injuries are generally diagnosed clinically and a stress fracture can remain undiagnosed for several weeks if radiologic investigations are performed only when symptoms persist.30 This implies that this specific type of diagnosis may have been underreported in our study. The importance of clear specification and categorisation of subsequent injuries, separating them from recurrence injuries, has lately been emphasised.22 ,31 We found that successive injuries accounted for 59% of all injury events recorded. The low proportion of recurrent injuries found in this study (8% of the successive injuries) could be explained by the strict definitions used. In an injury surveillance study covering high-school team sports and cross-country runners, Rauh et al23 ,32 found that almost 25% of athletes reported multiple injuries. Why some athletes seem more prone to sustain numerous injuries has not been established. Possible causes are that some athletes are more exposed to their sport or they may not have been adequately rehabilitated from a previous injury. Our findings also highlight, as indicated by Meeuwisse et al33 that even though athletes report being injured, they may continue participating (partially) in athletics training and thereby remain exposed to injury risk. What the high successive injury rate observed in our study can be attributed to remains unanswered. However, this study emphasises the need for further investigation to identify athletes at increased risk for sustaining multiple injuries, and to examine the consequences of these injuries and how these events affect overall athletics performance. Bennell et al6 found that close to 33% of athletics injuries are associated with a previous injury. A history of previous injury is a commonly observed risk factor for obtaining a new injury in sports.38–41 Why a previous injury is related to a subsequent injury has not been carefully examined. Little knowledge exists about the pathways between a primary injury and subsequent injuries, and about the relationship with treatment and rehabilitation. A number of extrinsic factors may contribute to why an athletics athlete receives poor clinical treatment and rehabilitation. For example, the athlete may live in an area where there is limited access to clinical professionals specialised in sports medicine, such as physicians and physiotherapist, leading to lack of proper services for diagnosis and rehabilitation. Sports medical practitioners may recommend return to athletics training and competition based on experience from popular but less physically demanding team sports, such as soccer. In addition, if the coach and athlete underestimate the injury severity,28 decisions regarding need for treatment and return to sport may become systematically biased. It has been observed in other sports that high-level athletes modify their training while injured, but still train at high volume and eventually increase load.42 ,43 However, this study has identified previous injury as a major risk factor in athletics, and we interpret that the need to fully understand and identify current gaps and barriers towards obtaining adequate rehabilitation for overuse injuries is most urgent. Conflicting results have been reported from studies in athletics regarding how injury incidence rates differ by gender2 ,6 ,12 and little agreement exists in other sports.38 In our study, we found that male athletes, youth and adult, with a previous severe injury were at increased risk. The risk for male youth athletes was close to four times higher than female youth athletes without previous injury. 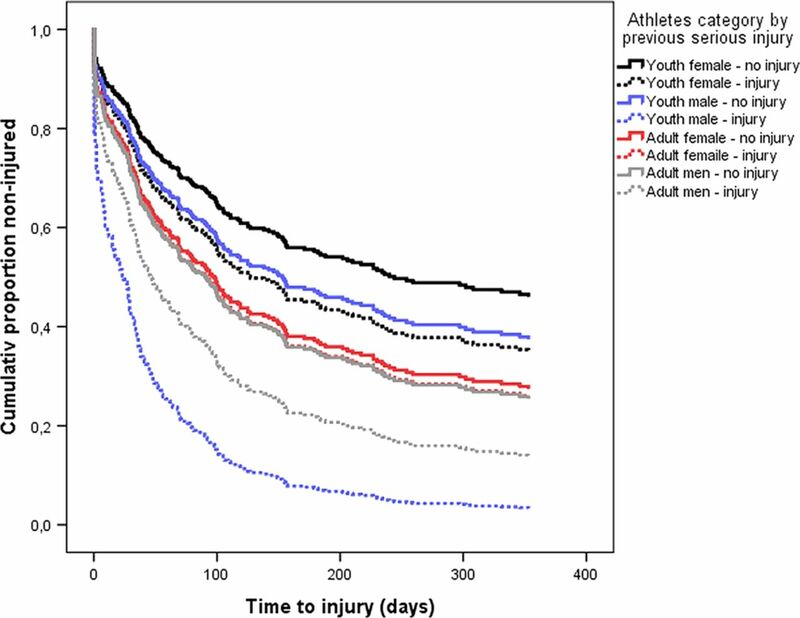 Because not much epidemiological knowledge about youth elite athletes is available, information about the impact of subsequent injuries among young athletes is also limited.24 ,44 Moreover, similar to reports from adult elite athletics competitions,2 adult male athletes in our study had a higher risk for injury. For further development of preventative safety programmes, understanding of athletes’ perceptions of injury risks is essential.45 and the literature suggest that these perceptions may be gender specific.46 Moreover, like Benell and Crossley,6 we found no difference between subgroups of events with regard to injury risk. This indicates the existence of systemic effects from athletics training, for example, the double seasons (indoors and outdoors) and preseason planning. Almost all injuries identified in this study were non-traumatic. This finding emphasises that there are knowledge gaps regarding the incidence and risk indicators associated with overuse injuries in sports.47 Overuse injuries have also drawn little attention when it comes to preventative interventions,48 even though such efforts have shown efficacious long-lasting effects in well-targeted groups of athletes.49 In particular, surprisingly little research has attempted to associate injury profiles with training-related factors, which in part can be explained by the fact that quantifying training loads is a challenging task.50 Injury profiles are known to differ between sports51 and certain sports have reported patterns of injuries linked to overuse that are also site specific, for example, climbers with tendinopathies located in the hands and fingers.52 These sports are characterised by recurrent discipline-specific movements and loads suggesting a connection with workplace routines similar to those seen in settings describing work-related overuse injuries.53 ,54 Elite cricket players have shown an association between a high throwing work load and a risk for upper limb injuries.55 At the elite level in athletics, training during the preparation period consists of weight training, sprinting, jumping, endurance training and other discipline-specific training performed at a high level with relatively long-training sessions and with increasing intensity, especially closer to the competition season. Similar to Benell and Crossley,6 we could not confirm any association between injury rates and hours or sessions trained, even though our results showed a tendency towards increased injury risk when sessions per week increased in number. However, we noted a significant association between injury and relative training load measured as a combination of hours and intensity. A similar relationship between intensity in practice and overuse injury incidence has been noted previously in elite settings.42 ,43 ,56 ,57 Gabbett58 has also reported associations between reduction in training loads and fewer injuries. In the study by Benell and Crossley,6 the injured athletes attributed almost 80% of injuries, particular those related to overuse, to a change in training during the month preceding the injury; the most perceived cause was an increase in training intensity. In rugby, Gabbett58 has reported associations between reduction in preseason training loads and fewer injuries. The dose–response relationship, or rather the training–performance relationship in sports,57 is an area for further research because optimising training without obtaining adverse effects such as injuries is highly warranted in any elite sports setting. Several considerations have to be taken into account when drawing conclusions from this study. An overall concern with self-reported injury data is the reliability and validity of the diagnosis. In this study, the injury follow-up questionnaire included a question on whether any medical practitioner had confirmed the reported diagnosis by a clinical investigation, and all self-reported diagnoses were evaluated by practitioners with long experience in clinical sports medicine. However, we do not know to what degree the information reported expressed the athlete's own opinion regarding the injury. The injuries recorded were mainly unilateral, of the overuse type, and affected body areas in accordance with earlier reports from athletics, for example, back of the thigh, knee and ankle. Another limitation of this study is the notion of new injury. The results suggest that it may not have been the athlete's factual first injury that was recorded as the first injury during the study period, but rather one in a sequence of interconnected injuries. This indicates that more investigations on recurrent injuries and the lifetime prevalence of injuries in athletics are warranted. Almost 50% of the targeted population consented to participate in this 1-year individual-level study, which can be considered satisfactory. Also, the drop-out was not found to be skewed with regard to age, gender, event group and ranking. A limitation is that elite athletes affected by season-long injuries the preceding season were not included in the top 10 Swedish ranking list. This non-healthy worker effect59 may have biased the study population towards including more healthy athletes. No power calculation was performed to establish the size of the study population as a basis for statistical testing, since we aimed to reach the entire population defined elite athletic athletes in Sweden. An evident risk for type 2 errors must thus be accounted for when interpreting the results, in particular at the subgroup level. Furthermore, no anthropometrics data were included,17 implying that some explanatory variables causing injuries might not have been detected. However, not many studies have reported an association between injury outcome and anthropometrics. The TLRI used in this study should be considered as an explorative attempt to further quantify training load. For example, the intensity stated in the weekly reports in our study reflects the training schedule and is not a subjective measure of perceived training-related exertion. Musculoskeletal injuries among elite athletes are a common phenomenon and an understanding of the underlying causes is warranted in every sport. This study showed that both youth and adult elite athletics athletes are at high risk for sustaining not only one injury, but also multiple injuries during one season. The internet-based system for collection of injury data in athletics was found generally feasible. An adapted version of the system is about to be introduced for injury surveillance on a routine basis in Swedish Athletics. The frequent occurrence of injuries related to overuse suggest that most of the injuries observed are preventable by altering the exposure to athletics. This study also identified risk factors for sustaining musculoskeletal injuries that have relevant implications for prevention. In particular, two areas of concern were identified: a relationship with training intensity and athletes with previous injuries. Future studies should focus on measures to quantify training content in athletics and the development of protocols for rehabilitation of specific injury types to ensure a safe return to athletics. This prospective study identified a high incidence of injuries in youth and adult elite athletics athletes. The majority of injuries are of the overuse type affecting the lower extremities, and cause more than a 3-week time loss from participation. Many athletics athletes sustained multiple injuries during the study season. 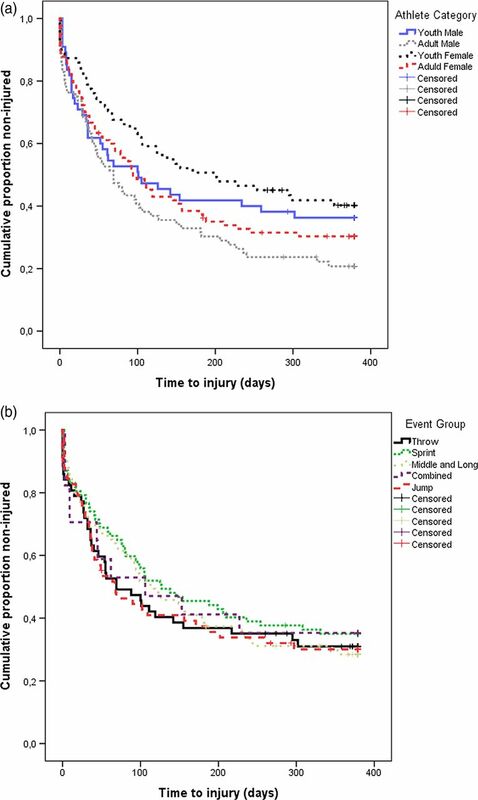 No difference between subgroups of events with regard to injury risk was found. This suggests the existence of systemic effects from athletics training. A training load index combing training hours and intensity and a history of severe injury the previous year did predict risk for injury.
. Occurrence of injuries and illnesses during the 2009 IAAF World Athletics Championships. Br J Sport Med 2010;44:1100–5.
. Sports injuries during the Summer Olympic Games 2008. Am J Sport Med 2009;37:2165–72.
. Determination of future prevention strategies in elite track and field: analysis of Daegu 2011 IAAF Championships injuries and illnesses surveillance. Br J Sport Med 2012;46:505–14.
. Injuries in runners. Am J Sport Med 1987;15:168–71.
. Prevalence of musculoskeletal injuries in Swedish elite track and field athletes. Am J Sport Med 2012;40:163–9.
. The International Olympic Committee (IOC) Consensus Statement on periodic health evaluation of elite athletes March 2009. Br J Sport Med 2009;43:631–43.
. Meeting the global demand of sports safety: the intersection of science and policy in sports safety. Sports Med. 2008;38:795–805.
. Track and field athletics injuries—a one-year survey. Br J Sport Med 1994;28:197–202.
. Exertion injuries in adolescent athletes. Br J Sport Med 1978;12:4–10.
. A prospective study of injury patterns in high school pole vaulters. Am J Sport Med 2008;36:913–20.
. Implementation and dissemination research: the time has come! Br J Sport Med 2011;45:763–4.
. Suivi prospectif des blessures en athlétisme. Étude pilote sur deux clubs durant une saison. Sci Sports 2010;25:272–6.
. Design of a protocol for large-scale epidemiological studies in individual sports: the Swedish Athletics injury study. Br J Sport Med 2010;44:1106–11.
. Musculoskeletal injuries description of an under-recognized injury problem among military personnel. Am J Prev Med 2010;38(1 Suppl):S61–70.
. Consensus statement on injury definitions and data collection procedures in studies of football (soccer) injuries. Br J Sport Med 2006;40:193–201.
. Consensus statement on epidemiological studies of medical conditions in tennis, April 2009. Br J Sport Med 2009; 43:893–7.
. Subsequent injury definition, classification, and consequence. Clin J Sport Med 2011;21:508–14.
. Subsequent injury patterns in girls’ high school sports. J Athl Train 2007;42:486–94.
. More data needed on injury risk among young elite athletes. Br J Sport Med 2010;44:485–9.
. Exertion injuries to young athletes: a follow-up research of orthopaedic problems of young track and field athletes. Am J Sport Med 1978;6:68–74.
. Incidence of injuries in high school track and field athletes and its relation to performance ability. Am J Sport Med 1987;15:251–4.
. Is there an injury epidemic in girls’ sports? Br J Sport Med 2010;44:38–44.
. Reinjury after acute posterior thigh muscle injuries in elite track and field athletes. Am J Sport Med 2011;39:304–10.
. The incidence and distribution of stress fractures in competitive track and field athletes. A twelve-month prospective study. Am J Sport Med 1996;24:211–17.
. Sacral stress fractures in long-distance runners. AJR Am J Roentgenol 2000;174:727–9.
. High school cross country running injuries: a longitudinal study. Clin J Sport Med 2000;10:110–16.
. A dynamic model of etiology in sport injury: the recursive nature of risk and causation. Clin J Sport Med 2007;17:215–19.
. No injuries, but plenty of pain? On the methodology for recording overuse symptoms in sports. Br J Sport Med 2009;43:966–72.
. Risk factors for lower extremity injury: a review of the literature. Br J Sport Med 2003;37:13–29.
. Evaluation of risk factors for injury in adolescent soccer: implementation and validation of an injury surveillance system. Am J Sport Med 2005;33:1882–91.
. Previous injury as a risk factor for injury in elite football: a prospective study over two consecutive seasons. Br J Sport Med 2006;40:767–72.
. Injury risk factors in junior tennis players: a prospective 2-year study. Scand J Med Sci Sports 2012;22:40–8.
. A 12-month prospective cohort study of injury in international rowers. Br J Sport Med 2010;44:207–14.
. Epidemiology of injury in child and adolescent sports: injury rates, risk factors, and prevention. Clin Sports Med 2008;27:19–50, vii.
. Understanding perceptions of injury risk associated with playing junior cricket. J Sci Med Sport 2011;14:115–20.
. Why do boys engage in more risk taking than girls? The role of attributions, beliefs, and risk appraisals. J Ped Psychol 1998;23:33–43.
. The long-term impact of overuse injuries on life-long participation in sport and health status. In: Farelli AD,. Sports participation. New York: Nova Science Publishers, Inc, 2011:85–104.
. Prevention of sport injury II: a systematic review of clinical science research. Br J Sport Med 2012;46:174–9.
. Continued significant effect of physical training as treatment for overuse injury: 8- to 12-year outcome of a randomized clinical trial. Am J Sport Med 2011;39:2447–51.
. The quantification of training load, the training response and the effect on performance. Sports Med 2009;39:779–95.
. Type of sport is related to injury profile: a study on cross country skiers, swimmers, long-distance runners and soccer players. A retrospective 12-month study. Scand J Med Sci Sports 2010;20:384–93.
. Rock climbing injury rates and associated risk factors in a general climbing population. Scand J Med Sci Sports 2009;19:850–6.
. Self-reported work-related symptoms in hairdressers. Occup Med (Lond) 2011;61:328–34.
. Occupation and epicondylitis: a population-based study. Rheumatology (Oxford) 2012;51:305–10.
. Throwing workload and injury risk in elite cricketers. Br J Sport Med 2011;45:805–8.
. Relationship between running loads and soft-tissue injury in elite team sport athletes. J Strength Cond Res 2012;26:953–60.
. Reductions in pre-season training loads reduce training injury rates in rugby league players. Br J Sport Med 2004;38:743–9.
. The health status of nonparticipants in a population-based health study: the Hordaland Health Study. 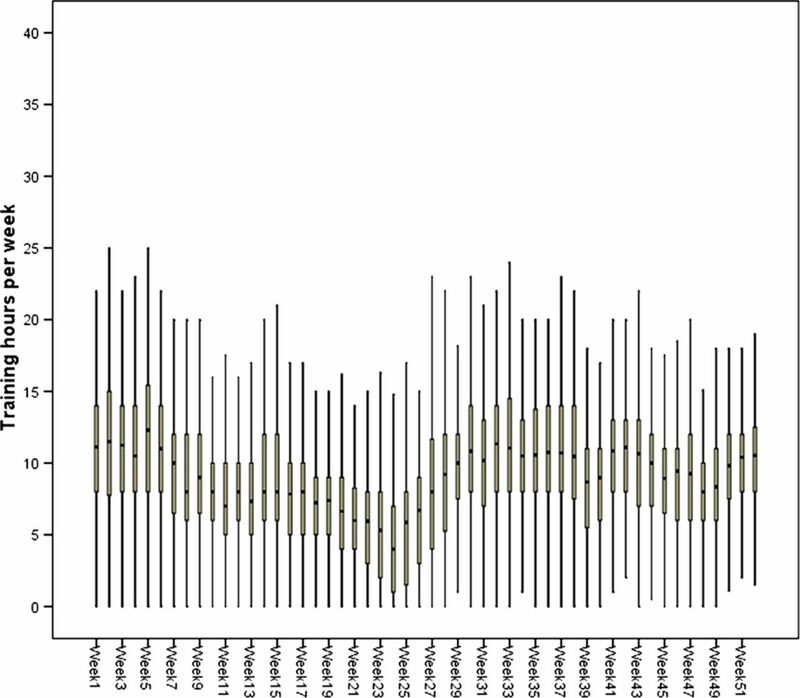 Am J Epidemiol 2010;172:1306–14. Contributors JJ TT JK and ÖD contributed in materials/analysis tools. JJ and TT wrote the manuscript. JJ TT JK JE SN and PR participated in conception and design of the project. JJ TT JK JE SN ÖD and PR participated in revision of manuscript providing intellectual content. TT is the guarantor of the manuscript content. Funding The study received research grants and research training support for PhD studies (JJ) from the Swedish Centre for Sports Research (CIF) (P2012–0138). Ethics approval Regional reaearch Ethics Board in Linköping.